The Newman family of Cambridgeshire are this week’s Geneabloggers topic for ‘Surname Saturday’ – a story of illegitimacy, windmills and dinosaur poop. A killer windmill, illegitimacy and dinosaur poop all play a part in shaping my paternal Newman family of Cambridgeshire. My earliest known ancestor (so far) was John Newman, the husband of Hannah (née Squire). They lived in and were married in Fenstanton, Huntingdonshire (as it was then in 1750). There’s no record of any earlier Newmans before this date and after parenting my ancestor Philip in 1760, there doesn’t seem to be another mention of them again. When Philip reached 19yrs old he marries Lydia Ingle in Haddenham, Cambridgeshire in 1779 and they begin a family together. However, after their sons Thomas and Philip are born, baby Philip and Lydia die – both being buried on the same day in Somersham. This appears to leave Philip (senior) with his young son Thomas. In September 1785, Philip re-marries, to Elizabeth Whitehead of Haddenham. The couple soon grow their family – having six children, although sadly their first (William) and fourth and fifth (Robert and James) children do not survive infancy. This leaves two daughters (Ann and Rebecca) and William. In 1809 tragedy struck as Philip, working as a Miller at the mill of William and Robert Pate of Haddenham on 20th July 1809 “was caught in the works of his mill, and unfortunately killed” – as reported by the Cambridge Chronicle, dated 22nd July 1809. Philip was promptly buried the following day at Haddenham parish church where the register notes him as being both a miller and a baker. He was 49 years old. The mill (known most recently as ‘Neville’s Mill’) no longer stands, although the windmill (The Great Mill) opposite the site is still standing and is being lovingly restored – well worth a visit to see what working in a mill may have been like. 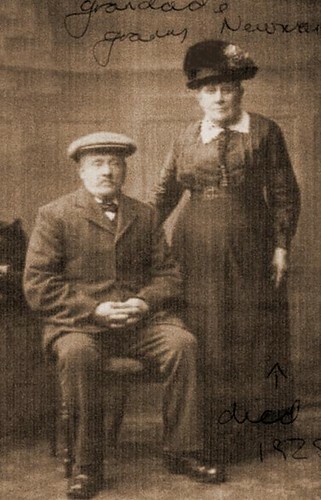 Having lost her father to the horrific sounding windmill accident at the age of about 5yrs, Rebecca Newman gave birth to a son Charles Newman in Somersham at only about 16 years of age. Whilst she was not married, parish records name an ‘Elias Dann’ as the father. Rebecca does not go on to marry Elias, as it would seem that Elias may have already been living with his wife in nearby Wilburton. Being a fatherless teenage single mother must have been excruciatingly difficult for Rebecca in the 1820s. However, by 1826 she had married John Seymore of Haddenham and bore him two daughters. It appears that illegitimate Charles Newman was fully aware of who his father was, as he names him when he marries Emma Levitt at Swaffham Bulbeck, Cambridgeshire in 1847. The couple also name their youngest son ‘Elias Newman’. The couple remain in the village, with Charles becoming a blacksmith, and have six children. Coprolites (fossilised animal dung) were found to be excellent sources of fertilizer in the 1840s. Digging them soon became big business in the fens during the mid 19th century, although it began to decrease by the 1880s. Massive manual labour forces were needed to trace and dig out the seams of dung (you can even buy them today on ebay!) and my Newman relatives briefly became part of the workforce. The 1871 census lists Alfred Newman (the son of blacksmith Charles Newman and Emma Levitt), along with his brother Charles as a ‘Coprolite Digger’. By the time of the next census though, the industry has downsized and neither are digging for dung. In 1877, Alfred Newman marries Harriet Cooper in Ely, Cambridgeshire. It is here where the Newman family has reached today – with many descendants of their large family still in the city and surrounding villages. The Newman family faced terrible tragedies, but they have survived.